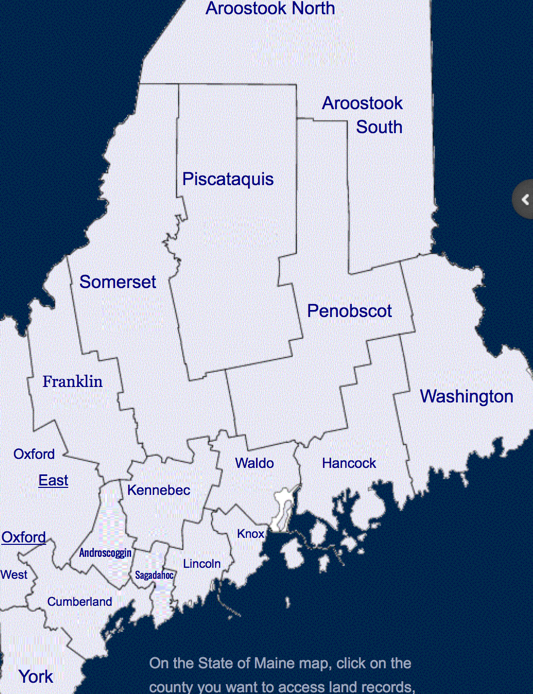 Maine research: some lesser known places to search – for FREE! I love Maine research. The Pine Tree State has made major efforts to digitize their records, increasing the odds of finding your ancestors in both free, online databases and government repositories. Additionally, I’ve found most town clerks and registrars very helpful and friendly, often willing to communicate via email regarding a research request. The state portal for the Maine Registers of Deeds is found here. Each county has various levels of digitization underway. 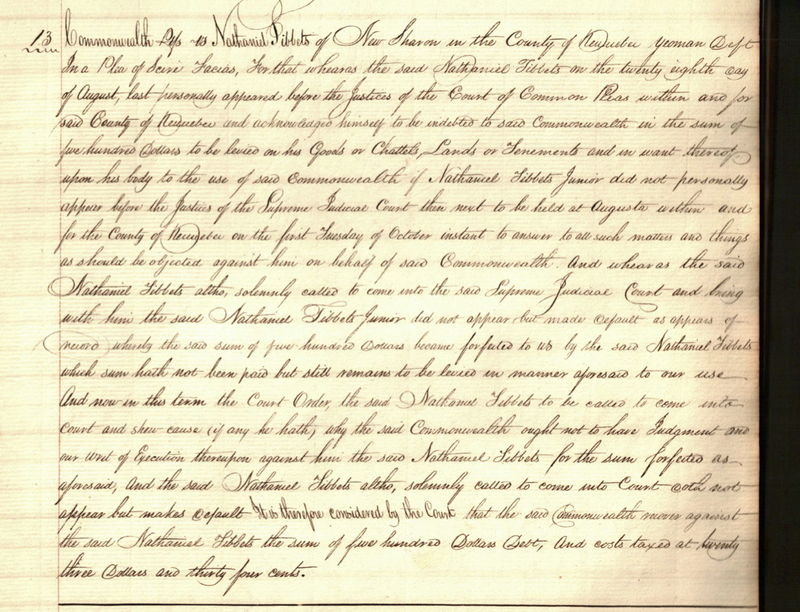 Kennebec County, for example, has indexed all of their deed books, including most historic deeds dating back to the late 1790s. Some counties have only digitized indexes for earlier deeds. Make sure you update your Java plug-in before attempting to view documents, and note that if you create a free user account, you are allowed to download and/or print 500 documents at no charge annually. MaineProbate.net is the online portal to digitized probate records in Maine. As is the case with deeds, each county is at various stages of digitizing probate records. Kennebec County, while ahead on digitization of deeds, has quite a ways to go on probate documents. I recently discovered mention of a probate record in a deed, and the probate document was not contained in the probate index. Piscataquis County, on the other hand has indexed most probate records. While only more recent records are available for viewing/download, you may email the registry to have the indexed record placed online to view the actual document. There has not been a charge for this request, but there is a fee if you instead ask to have the hard copy mailed to you. FamilySearch also has probate records for several counties available for viewing. They are, unfortunately, not yet indexed, and I haven’t yet figured out how they are organized. Still worth checking out. 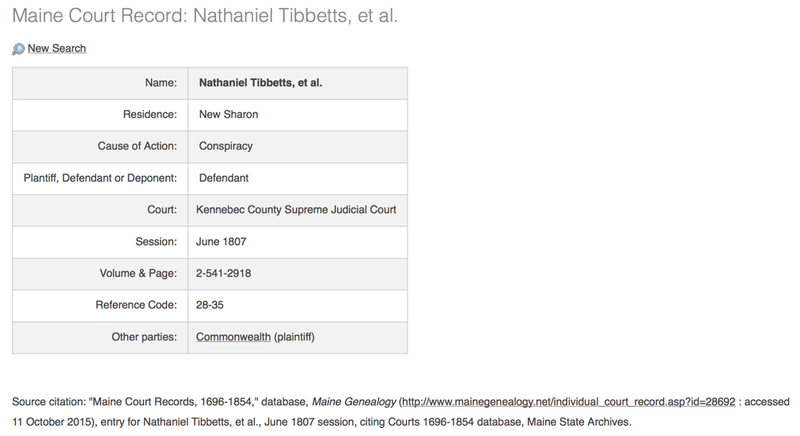 An excellent resource, MaineGenealogy.net provides an interface with major sites such as Ancestry.com, FamilySearch, and Fold3. Maine State Archives is wonderful to work with. While you won’t find much there that’s digital, they are very helpful and will scan and email documents to you if you provide them with a credit card, such as the court records shown above. While there are certainly other paid sites that I use to supplement my Maine research, these free databases simply can’t be beat. How about you – is there another free site that you use that is not included here? This entry was posted on Sunday, October 11th, 2015 at 4:52 PM	and posted in Learning, Web Sites. You can follow any responses to this entry through the RSS 2.0 feed. Thank you for sharing this list of resources. I am bookmarking this and will come back to it when I am researching my Maine ancestry!